In the tradition of Norse mythology, a Valkyrie is a female entity who determines which soldiers will not survive a confrontation on the battlefield. 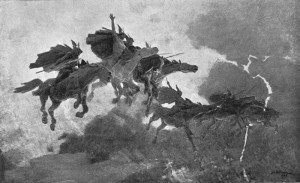 The word translates to: “Chooser of the Slain.” In some accounts, Valkyries rode into battle mounted on horses and hovered over the battlefield. They may have been virgins. They wore helmets, wielded spears, and are often referred to as shield maidens.They observed the warriors engaged in combat and held power over life and death. They traveled together in groups of six, nine or thirteen. After selecting the soldiers fated to die, the Valkyries collected their souls and escorted them from the battlefield. The first half were taken to Valhalla, a majestic hall ruled over by the Norse deity, Odin. The second group of souls went to Freya’s army field, Fólkvangr. Not only did these beautiful women have the power to decide who would live and who would die, but they also determined which souls were worthy enough to reside in the warrior’s paradise of Valhalla. Of course, not all Valkyries owed fealty to Odin. Some pledged fealty to Freya, the Norse goddess of love, fertility and battle. Valkyries possessed many supernatural powers, including the ability to change their shape. Several ancient Norse texts describe how the Valkyries were seen as swans when visiting the Earth during non-battlefield related visits. Being seen in their womanly form by mortal eyes carried much risk and there were powerful prohibitions against it. If a human man were to spy them in their natural state,they stood to lose all of their powers, as well as their immortality. In addition to being harbingers of death, they are associated with good fortune and safe journeys. On the stormy waters of the northern oceans, Valkyries protected, guarded, and guided the ships of those whom they favored. They were the lovers of epic heroes and the daughters of royalty. Ravens accompanied them on their travels. The ancient people of Scandinavia honored the Valkyries with poetry, elaborate carvings and works of art, jewelry and monuments.Some European museums display recovered charms and runes dated to the thirteenth and fourteenth centuries. Archeologists continue to unearth artifacts depicting Valkyries at excavation sites throughout the Norse lands.